The above was stolen from Mr. Forberg’s reflection of the start of the send off day. He so good I want him to write my eulogy, I’m certain he can make me seem likeable. Anyway, off the teams went. The boys and girls teams traveling together to the Illinois Cross Country State Meet held at historic Detweiller Park in Peoria, IL. It feels great to be heading South and the girls don’t miss the awesomeness of the event. Both mini buses head to a local breakfast spot for some nutrition, then off to Starved Rock State Park for some quality time with friends and nature. After an extended time of investigating the happenings of the wonderful natural formations and trails of the park it’s back on the road to Detweiller Park. As we pull into the park there are already teams from all over the state jogging the course and getting a feel for the route they will be running the next day. The girls appear to be calm, yet panurgic in their behavior. That’s what past experience will do for you. The experience being running state last year as a team. The coaches can sense the girls have a handle on what needs to be done. Actually, I get a nice lesson on what they did last year and I like that the girls have a plan of their own and so off they went to reacquaint themselves with the ins and outs of the course. After the girls run, the coaches meeting and checking out and buying some 2017 Cross Country State Meet swag we headed to our hotel. Rooms were assigned, keys were handed out, rest were taken and Bulldogs were spruced up. No Skanky attire would be accepted on the next leg of this adventure. Dinner at the world famous “Olive Garden” where we had reservations for 25. Without much panurgic all the young runners looked quite nice and the boys clean up very well. We were all ready for our meals with anticipation of no borborygmus to be had by any team member. We waited approximately 2 seconds to be led to our tables. Meals were ordered, stories were told and a good time was had by all with random mumblings and talk of cheese cake dessert being heard from one end of the adult table. But that was fugacious talk that was over before it started. Back to the hotel for last minute meetings and some last minute words from the coaches that might ensorcell the young runners and inspire them to sleep well and perform amazing the next day. Up at the crack of dawn… or was that thunder? Yes, it was wet when we awoke, but not back racing weather at all. No conditions that the girls haven't circumnavigated before in their training or racing this year already. Off to the course and dropped at the tent with plenty of time to spare. Girls were ready and the 1A girls were off and running as we dropped our bags in our tents. The day was going to be a very good day. We could sense it. The girls had their plans and nothing would divagate them from their predetermined strategy. So, off to warm up they go and at this point there is little a coach can do to help the girls run a great race. We had the plans of meeting at good ole box 19 and that is what we did 30 minutes before the start of the 11AM 2A Girls State Race. Energy was positive. Girls were ready and comfortable with many ‘good lucks’ flying their way. The whistle. The pop of the Gun! They’re off and running down the hill to the first turn. There is a strange quiet that follows the start of a XC race. It’s a strange and beautiful happening. Knowing that the girls are in a situation that is very intense and demanding makes it even more strange. The quiet and stillness of the start line after they leave is inspiring and encouraging to me. Witnessing the mass departure of all that energy is inspiring to me. Almost as if the universe is saying to the ones that are standing and watching, “The was powerful. Now what do you have to offer?” Anyway, the girls took off and at a good click and four of the girls, Cora, Melissa, Niela & Tess ran as a solid pack through the one mile mark at 6:25. Tara, Hailey & Nadia were 30 seconds ahead. Tara led the Bulldogs through the twist and turns of the course finishing at a great time of 18:34. Good enough for a 51st place finish. Nadia finishing 20 seconds behind at 18:57 and Hailey finishing strong at 19:00. Melissa finished less than a minute later at 19:55, then Cora(20:03), Niela(20:12) and Tess(20:19) rounded up the Bulldogs. Melissa, Niela & Tess finished with fantastic personal best times for a 3 mile race. Very impressive. Emma Forberg, Selena Axinte, Emma Fortman & Viktoria Hanson were the remaining girls that brought much needed help, guidance and encouragement for the girls that were able to run in this great meet. The girls finished in 17th place . The 2nd best finish of any RB Girls Cross Country team. Fantastic job girls you should be proud. This meet brings an end to one of the best high school cross country careers ever had by a girl at RB. She embodies what we strive to see in our student athletes in this program: hard working, enthusiastic about running, encouraging to fellow teammates, respectful to self, team and other competitors and the sport in general, long term vision of what a good strong person is to be, and an attitude that promotes positive and dissuades the negative. Hailey Jurgens finishes her career by running her best time of the year at the state meet. Other accomplishments from her amazing career includes: running at the State meet three times, collecting 4 All-Conference honors, 4 All-Regional honors, 1 Individual Regional Championship, All-Sectional honors, a member of 2 Conference Champion teams and 3 Regional Championship teams. Her state finishing times are 2, 3 and 10 on the state meet top finishing times for RB girl runners. Impressive does not even start to cover how amazing her career has been. Now with all these fancy numbers and accolades showered on Ms Jurgens, it needs to be understood that she did all this while maintaining excellent grades, participating in RB clubs, and activities. Best of luck to Hailey in the future. We wish nothing but the best to the wonderful seniors that have been a part of the Bulldogs running program over the last four years and this fantastic season. Here we go again, as Yogi Barra would say, “Deja Vu all over again”. The weather was starting to look like 2 years ago at the Kress Creek Sectional course. But no worries for these tough Girls, they were ready. One of the team targets this year was to score the fewest points at Sectionals. The girls did exactly that… but our 2017 arch rivals, Wheaton Academy, scored the same number of points, 77. The tie breaker did not lean our way. That’s a tough one to take, but the girls performed superbly during this strange weathered day: 35 degrees, wind blowing, sleet/rain, skanky sloppy conditions and on a tough course to boot. Tara went out strong leading the pack for a good portion of the 1st mile. Slowly the pack started runner her down, her reputation has become well known and runners were gunning for her. But her trusted teammates, Nadia & Hailey had her back and where there to encourage and push her during this run. Hailey took over leading the Bulldog group for some time until Nadia surged ahead of all the girls but one, . Nadia proceeded to complete the race 35 seconds faster than she did last year just off the lead runner from Wheaton Academy, of course. Hailey was seconds behind Nadia and Tara finished one place behind Hailey. This gave the three Bulldog girls a hat trick of sorts. Tara, Hailey and Nadia finished the season with All-Conference, All-Regional, and All-Sectional honors and that is no easy feat and something to be very proud of for sure. The other runners at sectionals for the Bulldogs finished in great times: Cora(20:31), Melissa(20:38), Niela(21:13), and Tess(21:39). Way to go girls!!! You secured the trip to the State Cross Country Meet in Peoria, IL. Second year in a row for many of these girls and another feather in the cap for all RB Bulldog Cross Country runners who can share in this excellent achievement. Home course again. It does feel nice to run at home, especially against the tough field that was running in the RB Regional. All runners need to be quite panurgic in their running skills to master the tough 3 mile course at Sundown Meadows. The course starts with a trick of kindness then as the runners enter the quiet solitude of the forest trail reality turns on the faucet. Ruts, hills, turns long stretches of subtle upness almost never giving relief to the hairier until she burst from the woods into the crowd of cheering cross country fans encouraging each runner as they make their way to the final 1000 meters to the finish line. On this day our own Tara Janney led the 63 runners into and out of the forest with pride. Again she was on her way to a first place finish, for the 2nd week in a row, which means she was 2017 Regional Champion. This is also the second year in a row that Tara, Nadia & Hailey finished as RB’s number 1-2-3 runners in the Regional Meet. After three years in a row of being Regional Champions, we gave up the title by 1 point to Wheaton Academy(38-39). Other runners in this meet were: Cora Lutes, Melissa Oliveira-Liz, Tess Bruno and Emma Forberg. Finishing up the Post Season Team are: Niela Callanan, Emma Fortman, Selena Axinte, Viktoria Hanson and Emma Pizana. Rain Out? Yes. After a short drive to the welcoming land of Fenton HS we were informed the Conference Meet had been postponed. No problem for the Bulldogs. We rode the bus back home and the girls rested up to take care of business on the coming Monday. We little operose the girls made the Conference title take away seem easy. Though they only beat the tough Wheaton Academy by 3 points it almost seemed an easy task because we had 5 girls finish with All-Conference Honors including the Conference Individual champion Tara Janney(19:27). The power of RB Girls XC was felt when Hailey(19:43) finished in 3rd place, Nadia(19:59) finished strong in 5th place, Cora(20:39) and Melissa(20:43) finished in places 12 & 13 completing the most girls to win All-Conference honors of any team in the Metro Suburban Conference. The young bulldogs running in the open race finished 2 points behind the Wheaton Academy girls for a 2nd place finish. Nice job all runners. ​Rain Out? Yes. After a short drive to the welcoming land of Fenton HS we were informed the Conference Meet had been postponed. No problem for the Bulldogs. We rode the bus back home and the girls rested up to take care of business on the coming Monday. We little operose the girls made the Conference title take away seem easy. Though they only beat the tough Wheaton Academy by 3 points it almost seemed an easy task because we had 5 girls finish with All-Conference Honors including the Conference Individual champion Tara Janney(19:27). The power of RB Girls XC was felt when Hailey(19:43) finished in 3rd place, Nadia(19:59) finished strong in 5th place, Cora(20:39) and Melissa(20:43) finished in places 12 & 13 completing the most girls to win All-Conference honors of any team in the Metro Suburban Conference. Go West young woman. A 5:30 am bus departure time on our way to Sterling, Illinois. A mere 110 miles West and you’re there. The early morning call time was no big deal for these young Bulldogs. Even with the storms brewing out West we were on the bus and determined to race against a field of mainly 3A teams. The girls ran a great race finishing in 6th place behind many state bound 3A teams and a strong Iowa team from the Quad Cities in Iowa. The Varsity girls were led by Nadia’s strong late race performance of 19:24 over the 3 mile course. Tara was right behind her at 19:32. Hailey(20:18) and Cora(20:48) both ran a strong race on the challenging course. Melissa (21:31) and Emma Forberg(22:45) both ran well as did Viktoria Hanson (22:55) in her debut as a high school varsity runner. With the tree’s patulous branches being a sure sign that a storm was coming the RB Open girls ran with a storm waiting in the clouds above. They ran strong as well finishing a respectable 6th place behind the Front running of Selena Axinte(22:56), Emma Pizana(23:37), and Zoe Jaquat(23:49) who all ran under 24 minutes on a tough Sterling course. Grace Faje and Kimberly Arroyo both decided to wipe away some time from their 3 mile times, subtracting 4 & 3 minutes respectively from their times two weeks earlier. Great job all young Bulldogs. This was an off week from racing. Harvest Christian Academy, The HCA Fall Classic. This is the first time this race has been conducted and and we Bulldogs decided to give it “The Old College Try”. And the girls did quite well. It was predicted to be a hot, hot, hot day after a week of perfect weather. Well the prediction was right on and the Bulldogs were the ones that proved they could handle the heat. The varsity Bulldogs walked away with the 1st Place Trophy! Our girls took off on the adjusted, adapted and extended 3.1 mile course through the woods, up hills, down hills and over roads. It was an unusual course, but nothing the girls couldn’t handle. Tara led the Bulldogs with a 20:14 time that was an excellent 3rd place finish in the race. Hailey was the 7th finisher in the race and Nadia was close behind in 9th place. They both ran a great race and looked as if they were flying down the last hill heading to the final loop around the baseball field to the finish. Close behind the 3 top dogs were Niela, Cora, Tess and Melissa. It was really a strange and some might say, not well organized, finish to a race. One of our runners was left out of the official records (Tess), runners were timed incorrectly and moved back from finishing positions(Nadia). One self inflicted mishap was when our own Bulldog, Mr. Forberg and Niela inadvertently intercommunicated, which in turn extended Niela’s route to the finish by about 400 yards. Don’t worry Mr Forberg you only added about 60 secs to her time and didn’t cost the girls the first place title and... we still love you. The open race was just as memorable. All girls finished in fine fashion and with pride knowing that they beat the heat and can run in any condition. Bring on the heat. Right Katerina Super? Welcome to the fantastic adventure known as High School Cross Country running. You picked a great race to be your first in your career. 90 degrees? We don’t care and actually we kinda like the heat beating down on our exhausted bodies after the race and before the race, we don’t care. Our team’s borborygmus heard by all the competitors as we discovered we had no tent top was enough to fend off the competition from coming within 25 points of the varsity girls on this hot day. Right Molly? The 58th Annual Riverside Brookfield Invite! It’s a great week to be a Bulldog! The home invite this year was held on a beautifully warm Fall day at the spectacular Sundown Meadows. An ideal setting for a high school Cross Country Invite. Over 850 runners, coaches and spectators filled the park with energy and excitement. Runners from 18 schools came to test themselves on the challenging RB home course at Sundown Meadows. Their running times may not be what they hope for but the memories of challenging themselves on this amazing course will be something they will carry with them forever. The Bulldog athletes arrived earlier than the other schools and most of them know the drill… Put up the tent, claim their spot in the shade, ready their racing wears… the normal stuff. But we can all feel that today is more than normal because it is our invite. Some Bulldogs have securely implanted self induced pressure to perform well during this race. I think all home teams want to perform well at their home course, same as any other sport. On reflection the girls competed well and again almost every lady Bulldog that ran last year’s RB Invite, bettered her time at this year’s meet. This is really becoming a excellent trend for these competitive Bulldog girls. The Varsity girls started out strong with Tara and Hailey in the front group as they entered the forest. Nadia, Cora, Niela, Melissa & Emma Fortman were not far behind. It was a warm day and rumor has it, it was even warming in the forest were the breeze was replaced by a humid stillness. All the spectators know is once the runners enter the forest the energy and excitement of the race seems to go with them. Only when the girls complete their 2 mile loop in the forest do the spectators feel the energy return with a vengeance. Several runners in is our own Hailey Jurgens leading the Bulldog girls out of the forest. This year the top 5 RB runners averaged the exact same time as last year’s race. Tara was sick and out of school for 3 days, so was not able to finish this race and Emma Fortman ran courageously with a foot injury. Nadia, Cora, Niela and Melissa all completed the race grandly by taking a combined 4 minutes and 38 seconds off their combined times from last year. That’s actually hard to believe but true. Yes, the open race. All the girls know this course is a little more scenic, a little more difficult and a little more friendly and they approach it with respect and desire to do well. One of our newest girls and one of the veterans went out hard and showed the visiting girls how to hit the trail with force. I believe this course wakes up the girls every year. It’s always tougher than they think, with it’s ruts and rocks and unnecessary difficulties that seem to change from week to week. Some of our Bulldogs in the open race improved on their times from last year and some found the Sundown Meadows a tough challenge and decided to take a little more time to finish the 3 mile route. Maybe they were taking in the beauty of the forest and reflecting on the fugacious moments that seem to be dissolving right before their eyes. The team was challenged by the newly invited schools that came ready to strut their abilities. Tess Bruno decided she was going to give this race all she had! That she did. She used this race as a learning tool, running fast early and realizing the race isn’t won in the first mile. But she will run better and smarter because of the challenging effort she put in this day. Emma Forberg took the race and ran it like the seasoned runner she is… finish a strong 15th place in the race and first for the Bulldogs. Gabby & Selena ran almost in sync with 3 seconds separating their race and Viktoria was right behind them and all three finished under 24 minutes. Emma Pizana has been running very well her senior year and she proved it by taking 1 minute off her 2016 RB Invite time. Other seniors that finished the race in style were: Zoe J, Paulina, Lily, Molly, Gabby T, Rose, Isabel M and Alexis. It’s been fun watching the seniors running this year. 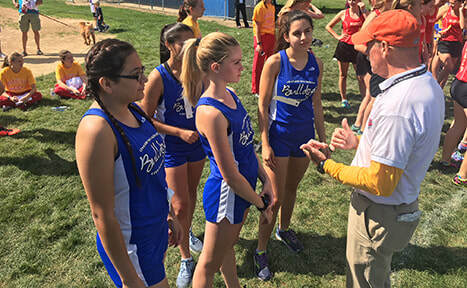 Many of them have been running for 4 years and they are having a good experience with leading and making the tough workouts bearable for the younger runners. The rest of the lady Bulldogs, including: Sophie, Ixxy Rurka, Angelina, Samantha, Aliana, Jacqueline, Frida, Jessi, Dalaney, Kimberly and Grace completed the race with pride and courage. At the end of the day, even though the Bulldogs did not take the Plague back home I would say the lessons learned were worth the energy expanded. I must put in a word for the parents and friends that helped out tremendously with this event. It wouldn’t have been successful without the help of all those people. We had past alumni of the running programs attend, Dr Skinkis (with his two young'uns in tow) and parents of students that ran years ago come out and show their support. I want to thank all that came out to enjoy this great event. Hello bright and early! Which really means dark and early, pre sunrise, 5:45am. That’s the time the bus, loaded with sleepy teenage lady Bulldog harriers pulled away from RB enroute to… Detweiller Park. THE Detweiller Park. As the very bi-respected and widely questionable and fact changing website, Wikipedia, says about the famous Detweiller Park, “ this three-mile course that ranks among the nation's best cross country course.” This is where the Bulldog ladies were off to run this beautiful Saturday morning. The First to the Finish Invite. More than 150 teams converged on the historic park to test their abilities against one another. Our lady Bulldogs were there as well and they were ready to ensorcell the crowd with their own racing courage. Nervousness was shown only by one rookie. Unfortunately, is was the girls coach, Me. I do apologize. They took it in stride and redirected my energies to the task at hand. Our first race was filled with 56 girl varsity teams. The Varsity Bulldog ladies, having played this venue before, again showed the youngsters the way things were done. Hailey, Tara & Nadia all completed the race in under 20 minutes, all finishing in the top 100 for the day. Tara ran away with a 22 place medal, her third meet in a row where she took home hardware. This makes 6 times Hailey has run this course and she has done a great job sharing her experience with the ladies that are starting to understand the subtleties and the challenges of the course. No doubt all Bulldogs running today have races left on this course to hone their Detweiller Park skills. Emma Fortman must love this course because she always seems to run a great race here. Tess Bruno ran a great race for her first on the course finishing just in front of the veterans, Niela Callanan & Melissa Oliveira Liz. Finishing up strong for the Varsity team were Gabby Nolan, Selena Axinte and Emms Pizana. The open race was next. 48 Teams and 813 lady harriers, wait how many? Eight Hundred Thirteen! Just a few hundred less than the boys open race that counted… 1050 runners. Talk about a big field. No worries, the young lady Bulldogs took it in stride, by running 18 girls in the gigantic field they gained experience and the sense that this isn’t as crazy as they thought. 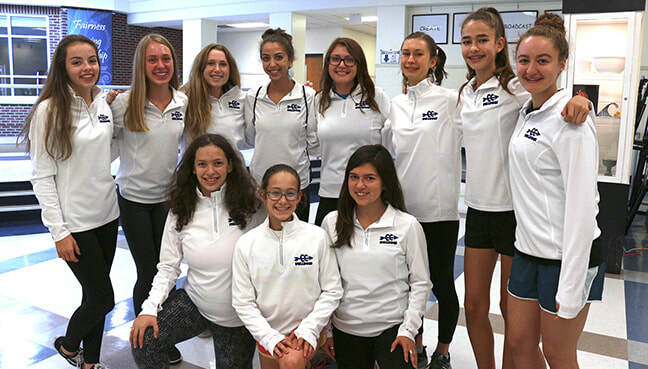 These young runners completed 3 miles for the first time in a Bulldog uniform and they did it with pride and heart: Viktoria Hanson, Izzy Rurka, Zoe Jacquat, Frida Kraus, Lily Jerz, Zoe Mazurkiewicz, Samantha Perez, Aliana Chiquito, Jacqueline DiMonte, Isabel Montefinese, Jessica Mancione, Grace Faje, Alyssa Garcia, Kimberly Arroyo, and Brianna Garcia. Right there with them guiding and educating them were veterans of the course: Sophie Jebb, Paulina Linares and Gabby Tarrant. They all should be proud of their achievements! Also, the girls that couldn’t run but, were with the team to support them or with them in spirit included: Natalie Baiocchi, Jane Bell, Emma Forberg, Alexis Garcia, Angelina Ocampo, Rose Ramirez, Katerina Super, Dalaney Stanford, and Molly Tracy. This meet is always a big event and this year did not disappoint. With the meet complete, camp broke, bus loaded and after a quick stop at the nearest subway the girls turned on the tunes and we all headed back to the friend zone of RB. What a perfect day for the LT Cross Country Invite. The grass was wet the sun was out the temperature was Perfect for the first race, the girls JV Open 3 mile race. With close to 300 runners lining up, it was the largest race of the 8 that would be run this day. The Lady Bulldogs contributed 9 runners to the mix and 5 of them had not run 3 miles in a race for RB until this race. Those runners ran well and with heart as they circumnavigated the the grassy terrain of the LT athletic campus. Blazing through twists and turns that can ruin a master runner, but is no match for these young strong dogs. Gabby Nolan led the JV Bulldogs with an impressive 23:11 and at the 2 mile mark she was 1 minute faster than her 2 mile time from the previous week at Elmwood Park. She wasn’t the only girl shredding their 2 mile times from the previous week... Emma Pizana, Zoe Jacquat, Molly Tracy, Isabel Rurka, Paulina Linares, Gabby, Tarrant, Lily Jerz, Isabel Montefinese & Jessica Mancione, almost everyone of them, took time off their 2 mile times from the week before… and they still had to run another mile. The ineffable joy I get from witnessing the growth of runners is maybe the best part of working with young inexperienced runners. Next up Varsity. Let me tell you the JV crew was not the only pack tearing up the course and previous times. The varsity Bulldogs were led by Tara & Hailey from the start. Both finishing strong under 20 minutes. At the ½ mile mark Tara was leading the pack of mostly 3A runners as if she was showing them the course, making sure they didn’t get lost. She finished a fantastic race in 7th place. Hailey was the 2nd Bulldog to complete the race with Cora, Melissa, Niela, Emma Fortman & Emma Forberg not far behind. Same as last week nearly all of them taking time off their last year’s time at this same meet. Freshman! Step up to the line! But, not until after the veteran girls, as mentioned earlier, show them more of the ins and outs of the pre-race stretching, warm ups, drills, stride outs routine. The nervous energy floating around the starting line is palatable and can’t help but make a running fan smile. At the sound of the gun 10 of the youngest girls on the team took off to run for the Bulldogs. Tess Bruno & Viktoria Hanson led the freshman through the unfamiliar fields of grass. By now the temperature had started to rise above the comfortable zone of running, so these girls had to dig deep and run strong. They didn’t disappoint. Only their second run of the season and some of the girls took off more than a minute off their previous weeks 2 mile time (thank you very much Grace Faje… that’s right she took off more than a minute from the week before). 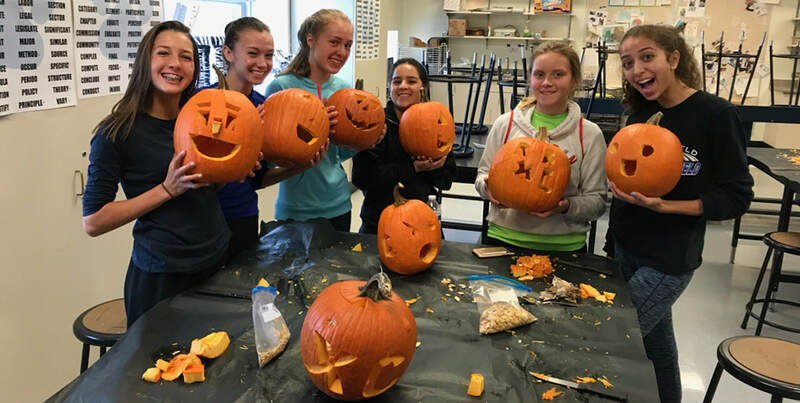 The other Freshmen that took on the challenge were: Angelina Ocampo, Zoe Mazurkiewicz, Samantha Perez, Frida Kraus, Delaney Stanford, and Kimberly Arroyo. Final girls race, “The Sophomores”. Hottest race of the day, only the strong survive. 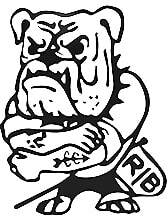 The Bulldogs only have four ladies representing RB in this race. Size we lack, but heart we don’t. Two veterans and two rookies to the 3 mile race. Sophie Axinte & Sophie Jebb, having run the distance before had no problem knocking triple digit seconds off their combined time from last year, and had no problem leading Aliana Chiquito and Alyssa Garcia to the finish line. The LT Invite is in the books, RB was a 2A school among some giant 3A schools and they came out with their heads held high and ready for the biggest Invite of the year next week in Peoria, IL, at the infamous Detweiller Park. See you then. Finally! Let’s get this going. Cross Country Season is under way and the girls knew how to start the season off right. With an Invite Victory! But wait, a lot happened before they were able to bring home the Varsity Team Champion Plaque and Third Place Plaque in the Frosh/Soph race. Elmwood Park Invite, “Trial on the Trail”. A two mile CC race on a 1 mile loop. An excellent first race for rookies and a great race for veteran runners to see how they feel at this early stage of the season. The first race of the day was the Girls Varsity Race (Srs & Jrs). Seventeen Bulldog Ladies were readied in Box #6, the official barked final instructions to all 96 runners at the line, next the long tweet of the whistle caused a hush to fall over the crowd, then the crack of the starter’s pistol. The season was under way. Almost from the start it was our own Tara Janney that led the pack around the grounds of the Elmwood Park campus. With each turn she would continue to increase her lead flying to a winning time of 12 mins 12 secs. Leading the Bulldogs to a Team 1st Place finish and setting a new course record along the way. Followed closely by her teammates: Nadia Kaczmarz, Hailey Jurgens, Cora Lutes, Melissa Oliveira-Liz and Niela Callanan. Everyone of these girls finished under 14 minutes. 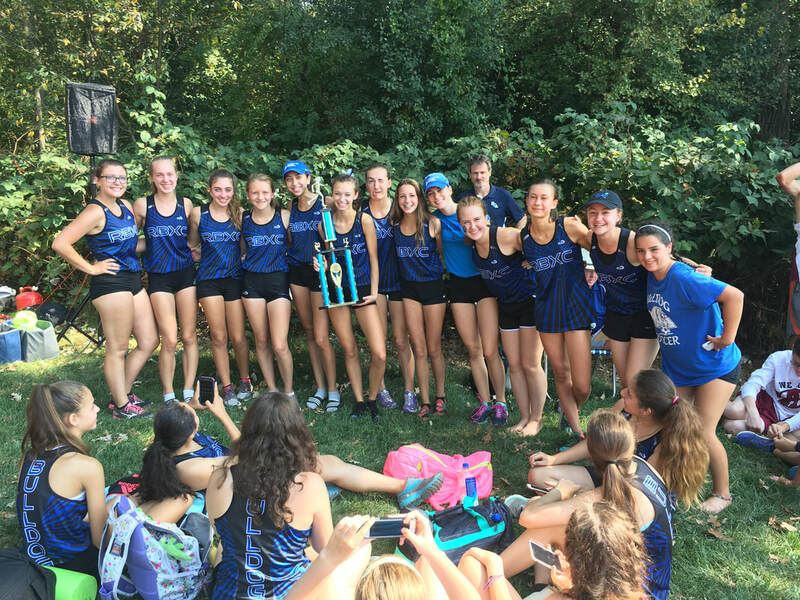 Finishing strong for the Bulldogs were also: Emma Pizana, Gabby Nolan, Paulina Linares, Molly Tracy, Zoe Jacquat, Izzy Rurka, Rose Ramirez, Gabby Tarrant, Isabel Montefinese, Natalie Baiocchi and Lily Jerz. Six of these upper class high school girls have never run in a CC meet. One of the senior ladies, whose initials are, Gabby Tarrant, was seen by her “CC Coaching Dad” competing in a meet for the first time ever in her high school career. Way to go Seniors and Juniors! Next the Boys team, likely inspired by the great performance of the Sr/Jr Lady Bulldogs, decided to put on an exhibition, that some likened to the “Dream Team” from the 1992 Summer Olympics, and finished 1, 2, 3, 4, 14,15,19… easily winning their race with 24 total points. The frosh/soph girls were next. The young Lady Bulldogs Lined up with 9 of the 12 runners having never race in a high school CC meet. Some were nervous, some were excited and some were both, but all were ready to see what they could do on this beautiful August day. Two of the girls finished under 14 Minutes, Tess Bruno(13:32) and Emma Fortman(13:52). Selena Axinte, first timer Vika Hanson, and Sophie Jebb finishing under 16 Minutes and the rest, all first timers, finishing in respectable manners: Angelina Ocampo, Zoe Mazurkiewicz, Samantha Perez, Aliana Chiquito, Jacqueline DiMonte, Frida Kraus, and Grace Faje. The Frosh/Soph team finished a respectable third place in their race. Way to go girls! What’s exciting about this is race is that all but two of the 13 girls that ran this year's EP Invite and last years EP Invite bettered their times from last year, some by 1:40 mins. Another hopeful statistic is that in last years race 3 of the girls finished under 14 minutes and in this years race 8 of our girls finished in under 14 minutes. 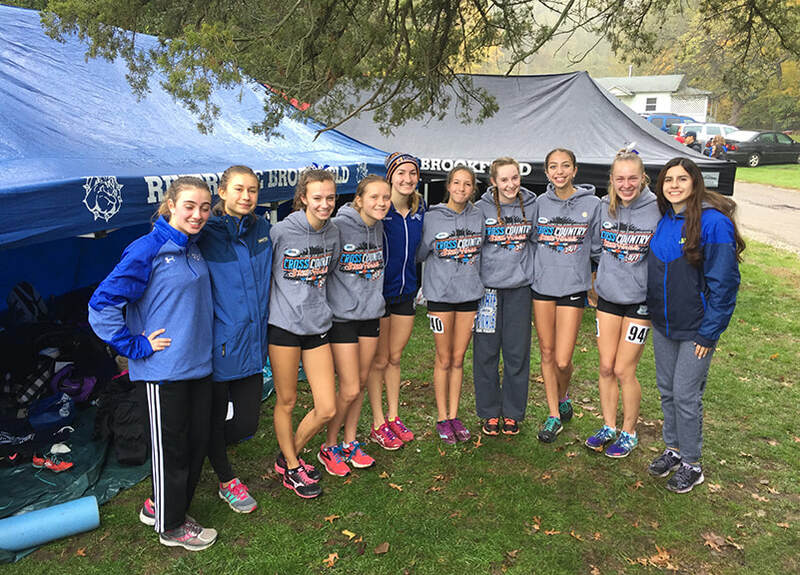 The girls appear to be proud of their race and more determined than ever to continue working hard and racing well. 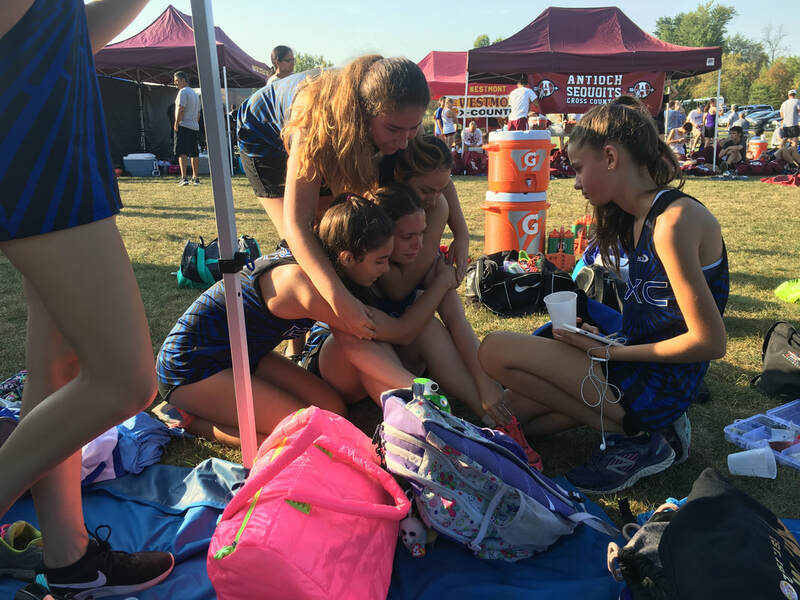 Even Though they weren’t able to run in the first meet, the following girls could be felt and heard cheering, helping and inspiring the Bulldogs to a successful first meet (Jane Bell, Emma Forberg, Alexis Garcia, Jessica Mancione, Kimberly Arroyo and Dalaney Stanford). These are the girls that make up the amazing 2017 Girls Bulldog Cross Country team.